St. Louis Co-Moderator Harper Barnes , now a freelance writer, edited the Boston Phoenix and was feature director and chief film critic for the St. Louis Post-Dispatch. He has written for the Atlantic, Rolling Stone, the New York Times and other publications. 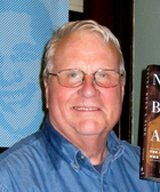 He is the author of "Never Been a Time," a history of the 1917 East St. Louis race riot; "Blue Monday," a novel set among the jazz musicians, gangsters, and corrupt politicians of Kansas City in the 1930s, and "Standing on a Volcano: The Life and Times of David Rowland Francis." Francis was the American ambassador to Russia during the 1917 revolution.